What is SEO? How do you do SEO? Complete guide for beginners. You are here: Home / SEO / What is SEO? SEO, or Search Engine Optimization, has almost become a buzzword that is mentioned in several instances. But what is SEO? SEO is a toolbox, which you can use to optimize your or someone else’s website so that search engines have an easier time indexing and categorizing the website in question. Besides making a search engine’s job easier, it also rewards you by giving you more customers. This happens because they have an easier time finding your website, as a search engine will have less trouble presenting your site to relevant customers. The SEO toolbox gives you an array of tools that can help you increase your organic traffic, which can save you a ton of money in the long run. The only problematic thing about SEO is that there can be quite a steep learning curve, especially if one has never really had an interest in how a search engine works. Search engine optimization consists of several different things, such as user experience, technical site specifications, link profile as well as keywords. In the course of this guide we will help you gain a fundamental understanding of what SEO entails as well as teaching you how to use SEO to improve your site or someone else’s ranking in the search engine results page. Let’s go back to where it all started. After the internet was launched there was a demand for a search engine that could index and categorize webpages after content and keywords, so that it would be easier for the users of the internet to find the desired content. This demand led to several different search engines, but during that time no rules or best practices existed and SEO was just like the Wild West. White text keyword spamming, link-catalogues as well as a high usage of tags were common methods for gaining rankings in the SERP (Search Engine Results Page). Using these kind of methods today is regarded as black hat SEO. Google won market share by introducing rules and regulations to fend off the spam to improve the user experience. This was at the same time that Google introduced the slogan “Don’t be evil” – a slogan which is worth keeping in the back of your mind while executing your search engine optimization. Besides these guidelines there are also the so-called “ranking factors”, which in varying degree have a say in how well your website will rank in the SERP. It is not entirely known how many different ranking factors that exist, but backlinko.com have made a thorough list of the 200 ranking factors that experts agree have an influence on your website’s ranking. And to complicate matters even further, Google has implemented further measures that are set in place to create the best possible user experience, and to combat any black hat SEO practices. These measures are Google’s own algorithms that keep an open eye on all indexed websites, and punish the ones that don’t follow the rule set. It’s a very good idea to read the above links to get an understanding of what kind of behaviour Google generally punishes and what they want to emphasize as Best Practice. If there are expressions, which you don’t understand you shouldn’t let it discourage you – we will go through most of the expressions and techniques in SEO so that you get a fundamental understanding of Search Engine Optimization. Since billions of Google searches are performed every day, it is easy to realize that search engine optimization has become so important. If you don’t give search engine optimization the necessary attention you risk being “overtaken” by competitors that invest the necessary resources – whether it’s time or money. Search engine optimization isn’t just about making it easier for search engines to analyze your website. SEO is just as important when it comes to user experience. You improve on this by following the Best Practice guidelines, which results in a website in tip top shape, leaving a positive impression on your visitors. Using resources on SEO is therefore a win-win, and if you hire a SEO consultant to do the work for you, the return on investment will almost be guaranteed as a well executed search engine optimization campaign usually gives you more customers or readers. Search Engine Optimization can either be done on one’s website or by improving on external parameters. The two ways to execute SEO are called On-Page and Off-Page SEO. On-Page SEO (or on-site SEO) are the optimizable factors that have an impact on your SERP ranking. As the picture shows, on-page SEO is about optimizing one’s content as well as HTML code, so the end result is a higher ranking in the SERP. By performing on-page SEO you help search engines and readers find out what your website’s purpose is and also what keywords it should rank on. In earlier days, the primary goal of on-page SEO was to spam keywords everywhere on the website so the search engines would recognize your website as being highly relevant for many different keywords. Today several other factors come into play as the Google guidelines show. As we linked to earlier, the 200 ranking factors give a great insight into what Best Practice for on-page SEO should be. A good rule to remember is that user experience constantly should be kept in mind. If you know your visitor and the content they’re interested in, search engines will usually reward you – that is if you succeed in creating structured quality content. As mentioned on-page SEO is also about optimizing HTML code, which we will dive down deeper into when discussing technical SEO analysis. Off-Page (Off-Site) SEO is about strengthening your position in the SERP by improving on external factors. To put it concisely, Off-Page SEO is about building your website’s trust, typically by having others link to you. By having others link to you, your back link profile is strengthened, which is very important when it comes to SEO. Building such links actively is called linkbuilding, which we will also discuss later in this guide. Off-Page SEO is not only about building links, but also about getting so-called “brand mentions” so that the public’s knowledge of your website or brand is increased. This usually also results in an increase in traffic. So how do you actually execute search engine optimization? It’s a very valid question, because as mentioned earlier SEO isn’t a singular thing but a vast array of techniques for optimizing a website. To create a user friendly website first and foremost requires that you have a sensible user interface. If you already think that your website’s design is done well and that it has a natural flow, it could be a great idea to have a family member or a friend visit your website and review it to ensure the user friendliness. It is usually hard to see one’s own mistakes so help is welcome here. A smart trick to use is the so-called “Starbucks Test”. This test can be used if you want to check the user experience of your website, if your logo is appealing or something else. The test consists of you going to a local coffee shop and asking strangers about their opinion of your product. By using this test you get an honest answer since the people you ask have no relationship to you or your product. Furthermore, the test is free. When you have ensured that the user enjoys using your website you should start thinking about the more technical aspects. If you haven’t already created a sitemap it’s a really good idea to create one, since it helps search engines figuring out how your website is put together. Luckily, tools exist to help you optimize your website. Our preferred tool for analyzing a website for optimization is Google’s own PageSpeed tool as well as SEOSiteCheckups tool. The information one gets from using these tools can be daunting, especially if you haven’t looked into what happens underneath the hood of a website. If you have a hard time understanding the results it can therefore be a good idea to contact a SEO-expert or just talk to your webmaster to figure out how to solve the issues. When the user experience is optimized fully, and furthermore have ensured that the site is optimized so that it loads everything quickly, you have created a solid foundation. Hereafter one can start optimizing for the other categories, which help grow the organic traffic. However, you must make sure that you don’t attract any random reader. Google also looks at users’ interaction on the website, which can have consequences if you attract uninterested readers. Therefore it is crucial to have content that appeal to a certain type of visitor. How you optimize your content is what the next category is about. As mentioned earlier, when the search engines had just arrived, SEO was just about stuffing one’s website with specific keywords to rank high. Today, keywords are still an important factor, but at the same time, there are many other factors that play a role, regarding how well your page is being ranked in the search engines. If you are a little unsure what keywords are, we have written a more in-depth guide explaining how to do your own keyword analysis. Among many things, the guide describes, how to track your SEO performance, which is a great idea if you decide to invest time and money in SEO. If you don’t want to invest time into learning it yourself, we will gladly help you conduct your website’s keyword research. Search engines nowadays have a much greater focus on quality content than they previously had. A good rule one should remember before publishing content on their website is: Is this something I want to read – and maybe just as important, does it seem natural to read? This refers to SEO back in the days, where the texts seemed very unnatural and were just written to fill the page with relevant keywords (known as “Keywords stuffing”). Therefore, if you have written a relevant article, with a completely natural and user-friendly flow, you should be home safe, which means you have produced content that helps to improve on your SEO. Let us assume you own a website that sells grills and grill equipment. Here it would be a good idea to publish some content on your website that somehow adds some extra value to your visitors. For example, this could be tips and tricks regarding how to clean a grill. In this way, you produce content relevant to your website, providing useful knowledge to the users of your website, and finally yet importantly, it can help improve your rankings on google. A smart trick when writing such an article is to make internal links, to your own products. If we go back to the example above, there is probably a need for some kind of cleaning equipment for the grill that your website sells. Here you can naturally make links to the products that are relevant. However, it is extremely important to make sure, that you always keep the text relevant for your users. That means you should only make internal links in your text, when it makes sense in the text. Also, make sure you do not target excessively many different keywords in your article. Have a “focus keyword” in mind when writing, and make sure to use it in a natural flow throughout the whole article. Short tail keywords are often very general words or phrases that contain only one or two keywords. Examples of this could be: “Cheap food”, “Cheap clothes”, “Cars”, “Restaurant Copenhagen”. Whereas long tail keywords consist of multiple words, and are often much more accurate and direct searches. Examples of this could be: “Best Family Car in Denmark 2017” or “Asian Michelin Restaurant in Copenhagen”. As this graph shows, there is a connection between “search volume”, “short / long tail” and “conversion rate”. The longer and more specific the search becomes, the greater the chance for users converting, which is a very important factor, in these modern times. As a website owner, you should therefore find out if there might be a few long tail searches that could be relevant to your website. There is a chance that these long tail keywords, only are searched for 10-15 times a month, however, these 10-15 people can be worth a lot for your business, as there is a high chance for them to convert. However, you should know that it has to be low-competitive keywords before you start targeting your different landing pages with those keywords. One of the ways to target these long tail keywords is not surprising, by producing very high quality content, directed to these particular keywords. To sum up, you can say that the majority of the Google searches is by short tail keywords. But there is a far greater chance of getting people to convert by the slightly longer and more specific long tail keywords. Original content is one of the keys to rank high in the search engines. An important aspect when writing texts for your website is that the content should be your own. If you choose to copy texts from other websites, the search engines consider this duplicate content. The search engines are not interested in displaying the same content in their search results. This means that only one of the two results is shown in the search results, while the other one will not be included. Printer-friendly versions of content on your page, can lead to duplicate content. This happens if you have a “Print-Only URL” that creates multiple versions of the same page. If your website exists with and without “www.”, Such as “mypage.com” and “www.mypage.com”. If these two pages contain the same content, it is considered duplicate content. In most cases, this can be resolved by making a “301 redirect” from the duplicated page to the original website. In this example, you should make a “301 redirect”, from “www.mypage.com” to “mypage.com”. By doing this, all the l traffic will be sent to mypage.com instead. Content you have copied from other pages. This is obvious duplicate content, but have you considered that, for example, product descriptions also count as duplicate content? It is therefore a good idea to write your own texts to the products on your website. We often see people copying texts directly from the producers’ websites, or worst of all, their competitors. Do you for example sell wooden boards in different lengths and types of wood; it is not enough to write “wooden planks” as the description. Here you should enter all specifications such as “Light oak planks in the length of 180×10 cm”, “Dark oak planks in length 150×10 cm” etc. Google does not penalize you by having duplicate content on your website, unless it is an extreme case. However, as mentioned earlier, by having duplicate content, your page may not appear in the search results, resulting in very little traffic for your site. Images and videos are also an important factor, when adding new content to your landing pages, as pictures and videos helps boosting your message. If you publish a long post with few or no photos at all, this may seem a bit overwhelming to the reader, who as a result, decides not to read your content. However, if you write a post filled with relevant images and videos, the post seems more welcoming and lures the reader to read it until the end. However, you cannot just add pictures randomly to your website. The pictures can also create more traffic towards your website, or even get people to link to your page / image. Google’s image search is often underestimated, and more and more people completely forget this opportunity to gain “free” traffic. Up to a third of all Google searches are image searches. In addition to that, approximately 12.5% of all search results, shows at least one image next to the search results. That means there is a huge opportunity to gain traffic by using images on your website. However, Google has begun to display images from their search results in large format if you click on them, instead of linking to the homepage they originally come from. Therefore, it depends a bit on which products you sell. Example show the result after googling “weber gas grill”. Here the first image search result is a picture from XL byg’s website (Danish tool and timber shop). If you click on the image in the search results, it will initially be shown as above. Here you can then click on “visit” and buy the grill. If you sell products that are to be sold “visually”, it is a great advantage to rank high on Google’s image search. Another example is people who produce data graphically. Here there is a possibility that your material can be shared and linked to, if you rank high on the image search. Here, for example, your images may be used as source on other websites. It is also important that the images and image descriptions on your website match the text and the URL on the page for it to rank high. Alt text is the text associated with the image on your landing page, and it explains what is in the image and the image’s function on the page. Alt text is something you have to manually add, and we recommend that this is something you add to all your photos. As mentioned earlier, it is important that the text fit in naturally and, does not look like you are trying to fill the text with way too many different keywords. Do you for example have a picture of a mover lifting a chair out of a van; your text may be “Mover moving chair out of van.” Examples of bad or inadequate alt text would be “Mover” or “Mover shipping moving man lifting chair car wagon van truck mover truck”. The Alt text is one of the things Google’s search engine looks at to define what is pictured. Where ”img src” refers to the pictures title and ”alt” refers to the alt text. Before writing a post for a page, one should ask himself; what is the purpose of the text I am going to write? And probably more importantly, where and how should the content be published? How you should write and create your text depends on whether it is a long article, advertisement or perhaps a product description. First, you must find the general rules for the piece of content you are going to produce. If you are considering publishing an article containing 75 words, you might as well not do it, as it would probably end up being an indifferent piece of content, both in SEO terms, but also in terms of what the user can derive from it. However, if you can find a good way to extend the content and add a lot of extra useful information and content, it would probably be a good idea to produce the content. Are you planning to create an advertisement? Then the first thing you need to figure out is where the ad is going to be published. Just to name a few you could host your ad on AdWords, Facebook, websites and so forth. As the examples show, there are many different platforms to advertise on. And each platform is different as to which content you should produce. You must, of course, follow all the requirements the platform have, for you to advertise on it. But remember that advertising is not free, so it is super important that you really think through all aspects of your ad. Users nowadays are constantly exposed to huge number of ads during a day. Therefore there is no doubt, that the users of today, are very skeptical to ads in general and only click on the well-thought-out high quality ads. Getting help from others is very normal, and often leads to better results. This can be done either by contacting professional SEO and marketing agencies like Jaskov Consult, but sometimes forums and help from family and friends can be sufficient. This subject is something we have discussed a lot, but there is a quite important reason for that. If you start publishing irrelevant and meaningless content on your website, you are probably going to lose many of your visitors, and experience a drop in the search engine rankings. If you have a website with a blog, you are probably going to be contacted by many different random people, who offer to produce free content for your website, if they at the same time are allowed to make an external link for their own website. Be careful saying yes to this kind of agreement. Often the quality of their posts is really bad and inadequate, and only made with the intention of having a link pointing to their own website. Therefore, you should only say yes if you can see if their posts are going to create added value for your website, and more importantly, if it adds extra value to the users of your website. Create your own content! The internet has been around for many years and there is tons of different content out there. It may therefore seem impossible to add new and original content to your own website. Keep in mind that getting inspiration from other pages is not a problem, unless you duplicate others content. You can easily borrow ideas from others and just re-write it in your own way; so that it makes sense for your users (this is also called copywriting). There are many different ways to produce new content. For example, you can write about new products on your website, how to use existing products or maybe even talk about new laws and regulations that is relevant to your website and products. There is absolute no limits when creating content, so it is just about being creative. When you produce content for your website, it can often be a good idea engage the users to comment on your content. This can be done either by asking if they have any questions, user tips, experiences, etc. No matter what it is, it shows that your site is exciting and relevant, which is something Google and the other search engines see as a big plus. When producing content, you should always have the SEO aspect in your mind. However, this should not affect your thinking in every single word you write. Otherwise, it is going to end up being a mixture of mechanical and boring text. This is a bit like making a new dish for the first time. The first time you follow the recipe from top to bottom, and use the timer for everything. After you have tried the same recipe a couple of times, it becomes a bit easier and the result much better. Remember, you do not learn everything in one day. The anchortext is the clickable text that works as a hyperlink. Back in the days, most people had a tendency fill their anchor text with keywords to optimize them. However, this is not a good idea anymore, since Google penalizes this, and looks at it as spam. Just like anything else regarding SEO, it is important to have make a natural anchor text that does not break up the user’s reading flow, and affects the user experience. When should you use anchor text? There are many different situations where you can use anchor text. This applies both when you make internal and external links. But some of the most frequent times to use it are when linking to their own products, links to similar. Articles or links to external articles and websites. When to use anchor text? There are many different situations where it would be a good idea to use anchor text. This applies both when you make internal and external links. One of the most frequent ways to use it is when you are linking to your own products, linking to similar content or creating external links to other company’s articles and websites. Once you have optimized your texts with relevant keywords and made sure that all of your content is high quality, your page should be really well optimized regarding the websites “on-page” optimization. Your website is now user-friendly, it loads fast and it is packed with content that attracts the very right segment of readers using the thorough keyword analysis you have made. Therefore, according to our SEO triangle, it is time to make people aware of your website, which the last three categories will explain a lot further. As you probably already know, there is no quick or easy way to page one on Google. Google uses many different parameters to assess whether your website should rank high or low. It is estimated that there are up to several hundred different ranking factors Google uses to rate your website. We have therefore decided to only focus on some of the most important factors, that concerns user interaction. We have chosen to do this, as these are some of the key ranking factors that at the same time, are easy to measure. You can quickly measure if your SEO efforts are affecting these parameters. Click Through Rate (CTR) is a term that is often used when talking about online marketing. The term covers explains how many people that clicks on your link/banner/ advertisement. It explains how many people that click on your link, based on how many views it has. If 1000 people have been exposed to your ad, and 40 of these people decides to click on it, then your CTR is 4%. When people are exposed to an ad, it is called an “impression” and basically just covers how many people have seen your link/ad, etc. It can either be in the organic search results on Google, a newsletter, AdWords or any other form of ads where you pay for each click, also known as Pay-Per-Click (PPC). CTR is used as a measurement tool to assess how well, for example, an AdWords ad is performing. Each ad and keyword have their own unique CTR, which means that you can measure all campaigns and keywords individually. Is your ad not performing as desired, you can simply just change the ad text, and afterwards see how the individual CTR of the ad changes. CTR also helps determine the ad’s position and cost-per-click (CPC). The CPC covers the price you pay for each click on your ad. As mentioned earlier, Google and the other search engines are aiming to deliver the best results to their users, and here CTR is one of the key factors. Let us assume you have a website selling grill and grill equipment, and you have decided to have ads on Google (AdWords). If there is many people who, after searching for “cheap grill”, “Grill Equipment” and so on, decides to click on your ad, it indicates that your website is relevant to the selected keywords as your CTR is high. Conversion rate is the percentage of your visitors that completes a set “goal” on your website, out of all the visitors. A “goal” can be anything from a person buying a product on your website to somebody signing up for your newsletter. The most important thing is just that it is measurable so you can make statistics on it and measure how well the different goals converts. As the definition shows, conversion rate optimization can be a quite good investment if done correctly. Suppose you have 100,000 visitors for a specific month. Out of the 100,000 visitors, 7,000 of them opt to sign up for your newsletter. In this case, the conversion rate is 7%. This means that 7% of all the visitors have converted. There are several good reasons for setting different goals on your website. If you set up goals, in order to track conversion rates, you can specifically measure the quality of the actions you make on the website. For example, if you change your practice to get users to sign up for your newsletter, you can measure the impact of the change. Here you can test things like size and color on your “sign up newsletter” button and measure the different conversion rates. By doing this, you can continue optimizing your website. It is a good idea to know the meaning of Call-To-Action if you want customers to convert. It is roughly what makes your visitors convert. This may vary, and be anything from getting visitors to sign up for your newsletter, sign up for a 30-day free trial of your service, or something completely else. There are various factors that affect the effectiveness of your CTA. But the all-overall and most important factor must be that your CTA should be visible so that the users are not in doubt where the CTA button is. You could say it should work as a kind of “bait”. However, it is very important that the CTA’s location is natural and not an annoying and disturbing element that adversely affects the user experience. Your CTA text must be short and accurate, and could be texts like “Get Started”, “Start Trial” or “Try Free Now”. By placing these clearly, possibly in a colored box, your users are more likely to convert. The word “Bounce” covers how many of your visitors, that only visits a single page on your website, and then leave the page. “Bounce Rate” is an expression of how many of your total visitors are jumping back after just visiting your page. If a high or low bounce rate affects your rankings depends on which kind website you have. If you run a website that consists essentially of a single page, it does not really matter if you have a high bounce rate. An example of this could be a blog, where all of your blog posts are listed on the front page. If you run a website with many different landing pages, it is important that you have a low bounce rate to optimize your SEO performance. An example of this could be a website with recipes where people should click on the recipes to get something useful from the website. How do you lower your bounce rate, one might ask? Content that is easy to read. This is not a parameter that can be measured directly, and may not directly be a parameter you can put in the box “User Interaction”. However, it is one of the fundamental concepts that will get your users to interact with your website. A good user experience, which of course also includes easily readable content, is almost the most important factor in keeping your visitors on your website. If your website is user-friendly, there is a much greater chance that they would like to read more of your content, and afterwards continue on to some of your other landing pages. If the content is written in a way that is easy for the users to read, there is a good chance that your users decides to spend a long time on your page. Make sure to insert internal links on your website. If you write a blog post, make a link to similar articles during the post. But remember, the link should always be relevant and make sense to the reader. Again, make sure to think about the user experience all the time. Internal linking helps to increase the level of user interaction, thus contributing to improve factors such as the Bounce Rate. There is no one who likes to read outdated content. The internet is simply packed with so much new and updated content, which means you cannot have outdated content on your site, if you want many visitors. If you have blog posts that are too old in one way or another, make sure to update their content on a regular basis. A good exercise is to go through all your blog posts once a year to see if you can update them, or just add some more content. Check where your visitors come from and see if there is a source that has poorer CTR than the others. If you can see that there is a clear pattern, saying that your visitors from your Facebook ads have a bad CTR, you have probably targeted the wrong audience or made another “mistake” in your campaign. The easiest way to avoid these problems is by using structured goals and conversion tracking to ensure optimal efficiency of the resources invested. By doing so, you are more likely fix these ‘errors’ faster, so you do not pay for visitors that will not convert. Another scenario is if you run a B2B page. Here you can easily attract b2c customers who immediately leave your page when they discover it is only for B2B customers. If you run a B2B page while using online marketing channels like AdWords, it is extremely important that you monitor your traffic from those channels and keep track of how many converts. You can probably decide if it is a good idea or not to advertise on all your specific products. An initial exercise for a B2B website could also be to list all of its products in B2B and B2C, and afterwards only create ads for all the B2B products you are sure that the normal consumers are not going to click on (in order to avoid huge extra costs). In general, to keep an overview of your website’s traffic we recommend using Google’s amazing tool, Google Analytics. If your website takes a long time to load, there are many who quickly decide to leave the page again. It is therefore extremely important that your website is set up correctly to minimize loading time. If your website has a slow loading speed or if you just are curious we recommend you take a look at our dedicated page for website speed optimization. In recent years, traffic has shifted more and more to mobile and tablets rather than computer. This requires that your website is properly set up so that it can be read in a user-friendly way on both mobile and tablet. Is your site loading wrongly or slowly, on mobile devices, the user quickly loses the desire to interact with your website. This results in in fewer visitors and higher “bounce rate”. You can read more about this in the section on “Technical SEO Optimization“, or visit our dedicated page for technical SEO optimization. Pages per session are a bit related to bounce rate and covers the average number of pages each visitor visits per session. One “Session” is when a user clicks your page until they leave it again. If your visitors have a lot of pages/session on average, it means they are committed to your page, and your page is backed up by high quality content. This is a good indicator for the search engines, and can help you rank higher. Session duration is another factor that describes how much user interaction there is on your site. It is also one of the factors Google uses to assess how high your website should rank. Avg. Session duration covers the number of seconds from all sessions / number of sessions. The way Google measures the number of seconds from a session depends on whether there is an “engagement hit” or not on the last page the visitor visits. A broken link is often also referred to as a “dead link”. Broken links are no longer working for one reason or another. Below we have listed a couple of reasons why broken links may occur. Before that, it should be mentioned that broken links could occur both internally and externally. You can link to pages on your own website that do not work, or pages on another website that also do not work. Google are not big fans of broken links, and sees it as detrimental to the user experience, which actually can affect your ranking. To find broken links, you do not have to sit manually and check every link on your website. Fortunately, there are various tools to check links. We have with great success used the program called Screaming Frog, which is available in both a free and a paid version. If you have never heard of this tool before we recommend reading our guide that explains how to use ScreamingFrog to conduct a technical SEO analysis. If you have entered an incorrect URL as a link to your website. Therefore, always double check if you enter the correct link (and then check again). You may also risk linking to a page that does not exist anymore or has been moved. For example, if you have a link to a product out of the market, there is a great chance that the product page has been discontinued and therefore a broken link will occur. This can be corrected by correcting the link to a new relevant page if possible. If this is not possible, the link should be deleted. As the name suggests linkbuilding is all about acquiring links. These links are a way to gain another site’s value, which in turn increases your website’s trustworthiness to search engines usually resulting in a higher SERP ranking. It is also worth mentioning that building internal links on your website is a really good idea. Internal linking can be done by linking from one article to another one that is relevant for the subject discussed. If this is the first time you have heard about linkbuilding we recommend that you read our guide on linkbuilding. Once you have worked your way to a solid linkprofile you have done the necessary legwork to prepare your website for an increase in traffic. The reason being that search engines give you a better ranking in relation to the amount of “good” links you have earned. Furthermore, even without the use of Google, the increased amount of links usually result in more readers because they surf from the external website to yours by the use of links. By doing so you have reached the top of the SEO pyramid, which is social media. However, one should not underestimate the value of social media as it is an area in explosive growth, also as a ranking factor in SEO. If you own a blog or a web-shop you probably already have presence on several different social media – if this isn’t the case we recommend that you create a profile on all the major social media at this very moment! The value of being present can not be emphasized enough even though it of course depends on how many followers your social media profiles have. Using social media actively is a great way of reaching out to potential readers by sharing quality content and contacting popular influencers, which you potentially could create a partnership with (which is one of the linkbuilding strategies we explained in our guide about linkbuilding. When mentioning social media one’s mind usually instantly thinks of Facebook, Twitter or Instagram. However, one should not forget that Google also has it own social media. We’re of course talking about YouTube and Google+, where you should also be present with a company profile (and/or adverts). There has been a lot of talk in the SEO world whether Google pays more attention to companies active on its own social media websites but there has not been any official confirmation form Google. However, we still strongly recommend that you are present on these platforms and share content regularly – if possible several times a week! Companies that share content regularly have the possibility of creating a large group of followers and thereby reaching people, which would have cost a lot of money done the traditional way. Unfortunately it is only a small percentage of companies that are able to execute successful marketing strategies by using social media which is why it’s important to spend some time planning your social media marketing strategy before executing. The best companies have been able to create a social platform that is a funnel for a huge amount of traffic to their website every day. As mentioned search engine optimization also defines the field of technical SEO, which is the more nerdy and technical part of optimizing a website. When executing technical SEO you aim to please search engines and their crawlers by following the best practices for all the different categories. Synonomous with technical SEO you will find terms such as meta-tags, headers, robots.txt and no-follow. If these terms are completely new to you we recommend reading our guide about technical seo, which will help you understand how technical SEO is executed so you will be able to understand the rest of this chapter. Even though we have used the Screaming Frog SEO Spider tool in our technical SEO guide as an example of optimization you can easily optimize a website in other ways. Once you have understood what Best Practice is while performing technical optimization you can find the mistakes just by browsing through one’s website manually while having the developer window open, which shows you the HTML code behind. Naturally this statement presumes that you have an advanced knowledge of how websites and search engines interact. Technical SEO is not only for search engines but also about making the user experience even better. By adjusting variables in the “engine” of the website the experience implicitly becomes better for the user because search engines have an easier understanding of what content your website contains. What is the most important when performing SEO? After explaining what SEO contains on a basic level it might seem daunting to take your first step into the optimization process. Please be reminded that our SEO pyramid is our own subjective ranking of what we believe are the most important areas to focus on – while optimizing your website you might find that other things are more important to your case. 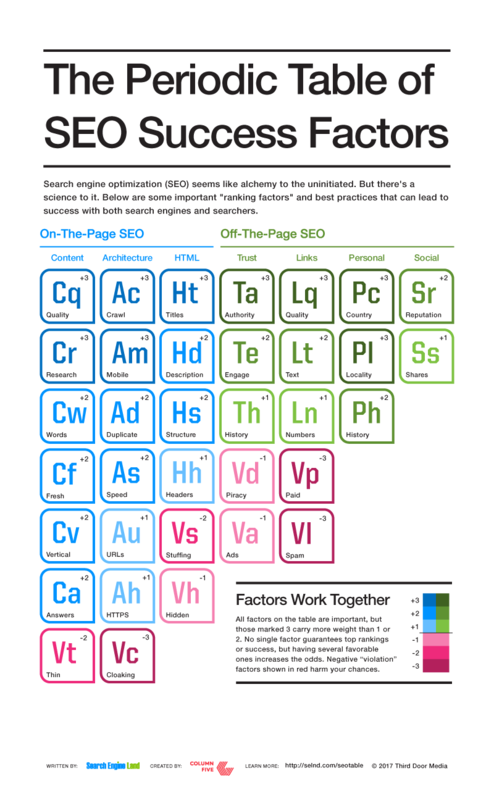 As the illustration shows SearchEngineLand has created the periodic SEO table with corresponding success factors as well as things you should avoid doing while optimizing your website. The table is extremely well made as it gives the reader a great overview of what the most important areas to focus on are according to statistical data as well as statements from Google. In the first column of the periodic SEO table we find “Content” where the two most important categories are Cq as well as Cr; Content Quality and Content Research. Correlating this to our explanation of the SEO-pyramid’s “keywords and text optimization” it is easy to see that having a website with quality content is paramount to reaching a great SERP ranking. Furthermore it is just as important that you research beforehand making sure that you don’t copy content that already exists (to avoid duplicate content). The other categories in the content column are also important but to less of an extent than the two above. Of course it is important that one’s content regularly is updated that you have vertical elements such as pictures and that your content is presented in a way that is easily readable. If you can “tick-the-box” for all these factors you will get a piece of quality content in return. This means that there is a symbiotic relationship between the elements, a fact that will be present throughout the table. In the other end we find the category Vt (Violation: Thin”. What they mean by this is thin content, which is content that doesn’t have any meaningful information. The point being that if your content isn’t rich on quality you can be punished. The column architecture represents two categories in our SEO-pyramid. The argumentation is that by optimizing the site’s architecture you help both search engines as well as users. The +3 categories in this column are “Crawl” and “Mobile”. That your website can be crawled by search engines is extremely important and users being able to access your website on different devices is equally important – especially in the year 2017. Again we see the combination of user experience and technical optimization as you can use meta-tags (nofollow or noindex) as well as exclusion of URLs in the robots.txt file to decide which URLs to be crawled and indexed by search engines. By doing so you can hide certain pages on your website that you don’t want the user to find by searching on a search engine. An example being pages that require the user to be logged in first. The graph correlates with Google’s mission to ensure the best possible user experience and makes it easy to see why they weigh a website’s mobile functionality so high. This is why it’s so important to make sure that one’s website works on many different devices. Ensuring this can be done in several ways, such as using a responsive webdesign, which your front-end developers can help you with if you aren’t familiar with programming. Furthermore “Duplicate” and “Speed” can also be seen in this column which are weighted as +2. What is meant by “Duplicate” is how well websites are able to treat eventual duplicate content issues – these can for example be solved using the canonical tag. The “Speed” category is self-explanatory as Google and other search engines wish to present the selected content to their customers as fast as possible. This means that it’s important to ensure that one’s website loads quickly as a slow website can result in a high bounce rate (as explained in the Google signals chapter) as well as a low percentage of returning readers. Of the least weighted categories we find “URLs” and “HTTPS”, which fall under the more technical part of SEO. In the “URLs” category a good URL is defined as one that doesn’t contain any special characters (such as øæå) or uppercase use. Best practice of technical SEO is strongly correlated to user experience as you optimize technically to ensure that your users and crawlers receive a more human-like impression of your website instead of confusing lines of code. The “HTTPS” category is about whether you, as a website owner, have invested in a SSL certificate, which is an identity guarantee as well as a way of ensuring that the communication between website and user is encrypted, resulting in a far more secure browsing experience compared to regular HTTP use. If you’re interested in knowing more about HTTPS and HTTP instantSSL has a quite good explanation. In the architecture column we furthermore stumble upon a penalty category by the name of “Cloaking”, which is weighted by the score -3. Cloaking can generally be defined as a website owner setting up two websites, where one is presented for the user and the other presented for a search engine’s crawler. By doing so one can deceive the search engine into believing that the corresponding website deserves a much higher rank than it actually does, as the user is presented for content no correlation to the search query, probably plastered with spam. As the category weighs -3 it is easy to realize that Google penalizes such black hat behaviour very strongly. Wikipedia has an excellent article about the term. In the HTML column we move into the technical categories of SEO, which can have a major influence on your ranking in the SERP. 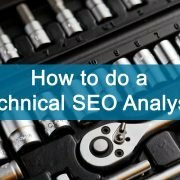 As written in our guide about technical SEO analysis a well-defined title tag is still very important when it comes to optimizing one’s website. Furthermore, a meta description is just as important as this is what users see together with the title tag when Google presents sites in the SERP. If you have written a great title tag as well as a fitting description you exponentially increase your chances of gaining a visitor. Optimizing for these two tags also help search engines index your website according to the correct keywords, helping you reach the proper audience. Of the negative categories one finds “Stuffing” as well as “Hidden”, which are usually seen combined on websites that practice black hat SEO. Basically, this strategy is executed by filling a website with a lot of different keywords to reach the widest possible audience. A fitting analogy could be shooting buckshots into the air without a defined target; the purpose is to have the search engine present the website to the user no matter the search query. Adding to this strategy, one can “mask” the keywords by turning the text white on an already white background, thereby deceiving the user into believing that the website has a higher degree of quality. Naturally, this is a very bad idea and it has lost a lot of its value as Google has developed its algorithm to target such behaviour. As mentioned in the beginning of this guide we recommended that you ensured that your website was optimized to the best of your ability on-site before moving into the off-site optimization, which starts drawing traffic to your site. Going through the three previous categories has been all about On-The-Page SEO and if you’ve understood as well as executed on these strategies (not the black hat ones!) you’re left with a great foundation for optimizing further according to the Off-The-Page SEO strategies, which are all about increasing the public’s knowledge of your website and brand. The first two columns in the Off-The-Page-SEO field are about “Trust” as well as “Links”. If you’ve read our guide about linkbuilding you should be acquianted with these categories as linkbuilding is also described in our SEO-pyramid. The categories in the “Trust” category will therefore not be explained in depth as you can easily look at the categories and relate it to what we’ve written in our llinkbuilding guide. However, the penalty categories are quite interesting as you can see that Google penalizes websites that contain pirated content. If you’re suddenly in the situation where a earned link stems from a website with pirated content you should immediately signal to Google that you do not wish to be affiliated with such websites. Using the disavow tool is the best choice for this. The “Trust” column are the parameters, which Google uses when its algorithm gives you a trust rating according to the incoming links that can be found in your backlink profile. The better these parameters are met (not including the violations), the more trustworthiness your website will be dealt. In the SEO field this is also known as transferring link juice. As mentioned it is the link that acts as a stamp of approval from one website to another. But even links are judged by Google to verify that best practices are met without exploiting the loopholes in the algorithm. In the “Links” column “Quality” is the most weighted category, which we have also discussed earlier. If you want to know how rich your website is on quality (determined by metrics) you can use a tool such as the Moz toolbar. Furthermore, the categories “Text” and “Numbers” are seen as positive parameters. “Text” is about whether your anchor-texts are best practice. As explained above an anchor is a piece of text that links to another resource. The anchor should therefore describe the destination resource in a concise manner, which Google also checks. The “Numbers” category is self-explanatory as it is about how many links a website has, yet it is still vital that the link profile doesn’t seem to have been exploited as that will increase the chance of a penalty. In the “Links” column there exists two penalty categories that both weigh -3, which is unique for the table. This proves that Google is very serious about how links are handled. Paying for links (“Paid”) or spamming (“Spam”), which both have the purpose of deceiving the visitor is extremely illegal according to Google’s guidelines. Buying links therefore breaks the guidelines and increases the chance of a penalty dramatically. Unfortunately, the market for buying links is still very big today and several established companies buy links, even though it is a very risky strategy that can result in the website being removed from the SERP. The “Spam” category is just as grave as spamming your way to a lot of links is a way of signalling to Google that you’re actively manipulating the backlink profile. Furthermore, spam links usually have no value for the users as these links usually are found in blog comments (made by robots) or in link catalogues. The last two columns are new in the field of SEO but are growing in importance every day. As the table suggests they contain no penalty categories, but one should expect Google to define violations or penalties as black hat SEO experts find a way to exploit social media. The “Personal” column is about local SEO. As a website owner you have the possibility to set the city as well as country of your business, which Google can use to present your website for users in the local area. If this information is coupled with the previous categories it can turn out as a great idea to partner with other local business as this signals to Google that your website is trustworthy because of the local recognition. Furthermore, Google usually finds out about the website’s country of origin by looking at the top-level domain (.com / .uk / .dk). If your website offers translations in different languages you can just use the hreflang to denote the different nationalities. The last and one of the most interesting columns is the “Social” column, which is about to what degree influencers (personalities with a lot of followers) share your content on social media. However, one should be very careful here, as it is very tempting to nudge the influences into sharing your content – either by giving them free stuff or paying them. One must be careful in this situation, as Google can regard this as paying for links, which is a serious violation of the company’s guidelines. Nonetheless it doesn’t look like Google is going to stop regarding social media as an important variable when it comes to judging your website’s presence online. As mentioned earlier it is therefore a great idea to create social media profiles for your website as they might reward users of their own social media more. Especially YouTube can be a very important SEO tool as the website has a lot of daily visitors that are constantly looking for new interesting content. By using YouTube as a marketing platform you can attempt to start gaining a footing here instead of using your blog, which might have a very low amount of visitors initially. Furthermore, the YouTube videos can be shared on the blog with a bit of additional text, which serves as content for both platforms without it being duplicate content. Relating our SEO-pyramid with the periodic table from SearchEngineLand you should now be able to see the correlation between the two. If you read the table from left to right you get a similar hierarchy as in our SEO-pyramid; first, on-site SEO is executed to prepare for an increasing amount of visitors. Next, off-site SEO is executed to start bringing in the visitors, which will help you gain footing in the competitive digital world. https://jaskovconsult.dk/wp-content/uploads/2017/10/what-is-seo-1504x1004.png 1004 1504 Lasse Munk https://jaskovconsult.dk/wp-content/uploads/2017/12/Jaskov-consult-logo-1.png Lasse Munk2017-10-12 13:59:302018-07-09 11:35:05What is SEO?